UPDATE 12/02 : Since this report originally ran there have been new developments that no longer point to Microsoft's security patches (KB976098 and KB915597) being the cause of the so-called "black screen of death" problem. Prevx, the company whose research many media reports were based on, conceded this point in an statement issued to its Web site late last night. PC World has published several updates to this story including: Microsoft: 'Black Screens of Death' Not Due to Patches, Microsoft: Don't Believe the Black Screen of Death Hype, and Black Screen of Death: A Lesson in FUD. Any Windows owner is familiar with the Blue Screen of Death, that much-dreaded white text on a blue background that essentially says you're through. But what you may not know is that there's a new contender in town: the Black Screen of Death. So what is this horrible-sounding thing, where did it come from, what's being done to fix it, and how bad is it? Here are five things you need to know about the Black Screen of Death. Microsoft apparently made changes to the Access Control List (ACL), a list of permissions for a logged-on user. The ACL interacts with registry keys, creating visible desktop features such as a sidebar. However, the latest patches appear to make some changes to those registry keys. The effect is that some installed applications aren't aware of the changes and don't run properly. Windows 7 haters: step back. The Black Screen of Death isn't relegated to Microsoft's latest OS. Security firm Previx states that the Black Screen of Death can affect Windows XP, Vista, and Windows 7 without prejudice. So if you're considering uninstalling Windows 7, fearful that it is the source of the problem, don't bother. You won't dodge any bullet. Gotta give it to Microsoft: It has a clever way of neither confirming nor denying the existence of a PC illness. In an e-mail statement obtained by PC World yesterday, a company spokesperson wrote: "Microsoft is investigating reports that its latest release of security updates is resulting in system issues for some customers. Once we complete our investigation, we will provide detailed guidance on how to prevent or address these issues." So does it exist or not? Yes it does. But Microsoft won't say for absolutely positively certain until it has finished investigating. That's when they broadly release a fix for the issue and maybe, if we're lucky, apologize for the inconvenience. Prevx, a UK security company that first discovered the issue, released both step-by-step instructions and a download to eliminate the Black Screen of Death. For those who like (and are capable of) popping open the hood of their PC, you can also modify registry settings, though this doesn't come recommended if you're unfamiliar with the guts of a Windows machine. So how powerful is this beast? Does it compare to the Blue Screen of Death? Nope -- they are entirely different problems. 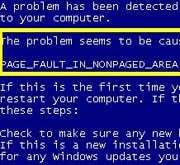 The Blue Screen of Death represents a hardware or driver failure, meaning something is wrong deep within the computer. The Black Screen of Death has relatively easy fixes and doesn't necessarily mean there is something physically wrong with your equipment. By now some of you may be sick to death of problems stemming from Microsoft and want a clean slate. Here's how to wipe your PC clean and start from scratch. It may not necessarily be the solution to your problem, or problems, but it can be a gush of therapeutic refreshment to eliminate (most) everything that's wrong with your computer. Stay tuned to catch Microsoft's official fix as soon as it is released.